Business Days are Monday-Friday. Business days are not holidays or "SCHEDULED OFF" days for the shipping companies. Please contact us for questions. We do not process or ship orders on weekends. Orders placed after 4:00pm Friday will be processed first thing Monday morning. Processing & handling times will start that Monday. We ship domestically in the United States and internationally to many selected countries. The United States, Canada, France, Ireland, Italy, Netherlands, Spain, Sweden, United Kingdom, Australia & New Zealand. If you are interested to know if we ship to a specific country then please Email us and we will respond at our earliest convenience. We offer FREE standard domestic (United States) shipping via USPS Priority (2-5 business days) for orders below $500.00 and UPS Ground (2-5 business days) for orders greater than $500.00. We also offer expedited domestic (United States) shipping via UPS 2 Day for an additional charge depending on your location. 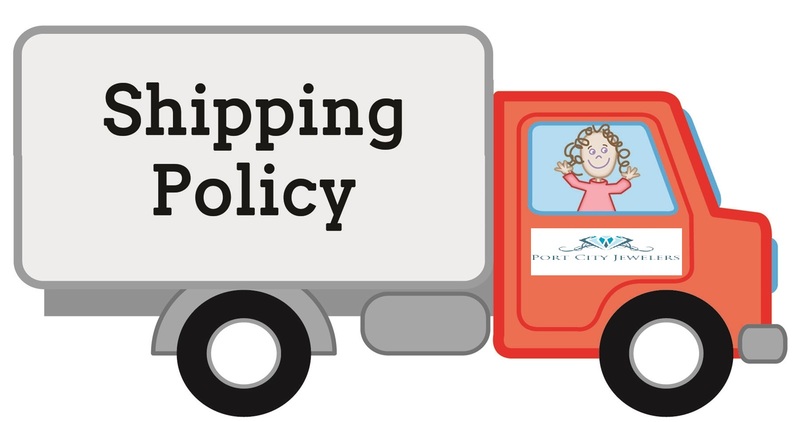 You may opt to purchase expedited shipping at the current shipment rates when you check out. All international shipments are subject to current international shipment rates, which will be shown on your screen during checkout. Are signatures required prior to delivery? Rest assured that all shipments of finished or custom jewelry above $500.00 will require a signature prior to delivery. We understand that jewelry is expensive merchandise so we make every effort to prevent lost/stolen packages. If someone is not able to sign for the package then a tag will be left at the front door for re-delivery or pick-up at a local facility. Your finished or custom jewelry package is not meant to be left at the doorstep unattended. If this happens this would be the fought of the shipping carrier. Yes, every shipment is 100% insured in an effort to protect your purchase in case it gets lost or stolen during transit. This is a preventive measure for your peace of mind. We typically use FedEx & UPS for orders over $500.00. We also use USPS on orders below $500.00 if free shipping is requested during checkout. What does processing/production time mean? Processing/production is the length of time that it takes for us to service an order from the moment we receive it to the moment of shipment. Custom orders will typically take longer to process since we will need to craft it from scratch and place it into production. If you are placing a custom order or an order that requires a more than normal production or processing time this will be communicated by a member of our staff or the verbiage will be displayed on our website on the products description page. What are your processing/production times? Domestic (United States) Shipping Time: 2-4 Business Days after processing/production time when choosing free shipping during checkout. International Shipping Time: 10 Business Days after processing/production time. Please know that we do not offer free shipping for international orders. You will need to log into your account on our website then once logged on click on "Order Status". From here you will be able see the current phase of your order. As always you can get in touch with use by email or VIA Phone. HAVE A QUESTION ABOUT YOU ORDER OR YOUR SHIPMENT THAT IS NOT ANSWERED HERE.